Lille is the capital of the Nord-Pas de Calais region. In the 19th century, Lille became the centre of French industry. The city has large coal deposits. Lille is also the central part of the country's rail network. The city has one of it's nation's largest university student population. It was once known as "the Manchester of France". Slowly over the years, the city has transformed itself into a cultural hub with the help of government investments. Area & Location: Lille is located in Northern France and is the main city of France's fourth largest metropolitan area. The city is located on the Deule River. Lille covers a total land area of 39.51 square kilometer. The 2004 population estimate is 226,800 with a density of 5,740 per square kilometer. 50º37'57?N latitude and 03º03'30?E longitude pass through Lille. Transportation: The city is well connected. Lille lies on the Eurostar line to London and the French TGV network to Paris. The city has two train stations. Lille-Europe station (Gare Lille-Europe) serves high-speed trains and Lille-Flandres station (Gare Lille-Flandes) serves lower speed trains. Lille is the city where you'll find the densest confluence of highways in France after Paris. 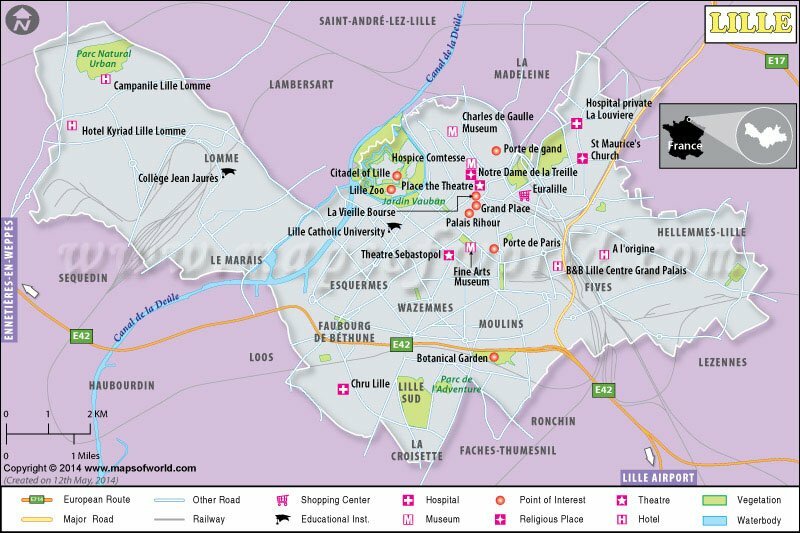 Autoroute A27, Autoroute A23, Autoroute A1, Autoroute A25 and Autoroute A22 are the five autoroutes that pass by Lille. The Lille Lesquin International Airport that is located at a distance of 15 minutes from the city center serves Lille. The city is the third largest river port after Paris and Strasbourg. Hotels: The hotels in Lille provide the tourists with the best services. Some popular hotels of Lille are Exclusive Hotel L'Hermitage Gantois, Couvent des Minimes - Alliance Lille, Crowne Plaza Lille, Hotel de la Paix, Mercure Lille Centre Opera, Ibis Lille Centre Gares, Hotel Lille Europe, Best Western Bellevue, Brueghel, La Howarderie Hotel, Citadines Lille Centre, Hotel des Tours, Ibis Lille Hotel de Ville, Hotel Chagnot, Novotel Lille Centre Grand Place, Hotel de la Treille, Sofitel Lille Metropole, Hotel Atlantic, Wimereux, Hotel Continental and Le Chateau des Ormes. Places of Attraction: Lille is a city that has a lot to offer its students. Some popular attractions of Lille are Palais des Beaux-Arts, Wazemmes Market, Vieille Bourse (Old Stock Exchange), Grande Place, Euralille Mall etc. There are many speciality shops in the city where shopaholics can indulge in shopping. Authentic Licence, Bidule, Michel Ruc, Carrefour, Philippe Olivier, La Cave d'Annie Paule, Balade nocturne, Chez Paul, Cle Astrale, Du Pareil au Meme, Eric Bompard, Godon and Harmonie Nature are some shops in Lille.